Don’t you just hate it when you are paying for services that doesn’t work as they should? Finally, after being a long-time subscriber, I went to a PLDT business center and asked them to cut my line. I told them to cut everything including the landline, mobile landline and DSL internet. They asked me why and I told them that the internet service is so slow (like less than 1Mbps slow) despite being subscribed to the 8Mbps plan. Then they proceed to ask me if I’ve reported the issue to their support hotline. F*CK! Of course I did! More than once! And nowhere near the advertised speed! For crying out loud, I am paying for almost 3,000PhP per month and I should be the one reporting if I am not getting the service that I am paying for?! Moving on, I subscribed to Smart’s All-In 500 plan since the 4G-LTE speed in my area is way better than their sister company’s DSL offering (yes PLDT, I’m referring to you). I intend to use the postpaid line as my internet for the household. The idea is to get charged P5 per 15 minute from the plan’s consumable amount and let the Anti-Bill Shock (ABS) kick in to cap the charges. The ABS was 1,200PhP for as long as I can remember but this October, Smart changed it to 2,500PhP. As long as I am getting better (unthrottled) speeds and no volume caps, I can live with that. 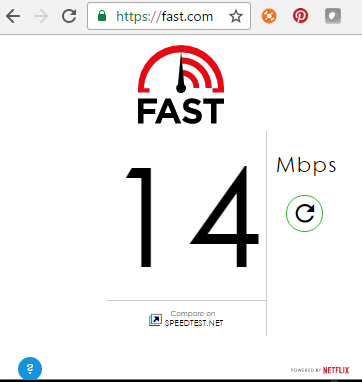 By my computation below and from my experience with PLDT, I’m still getting a better deal even with the new ABS. The only problem with the ABS increase is that my credit limit is set to only 1,000PhP. This means that if my unbilled usage goes beyond that limit, the service is temporarily disconnected. Smart has a dashboard called mySmart where subscribers can request for an increase in credit limit. Below the form is a section for Important Reminders – fair enough. 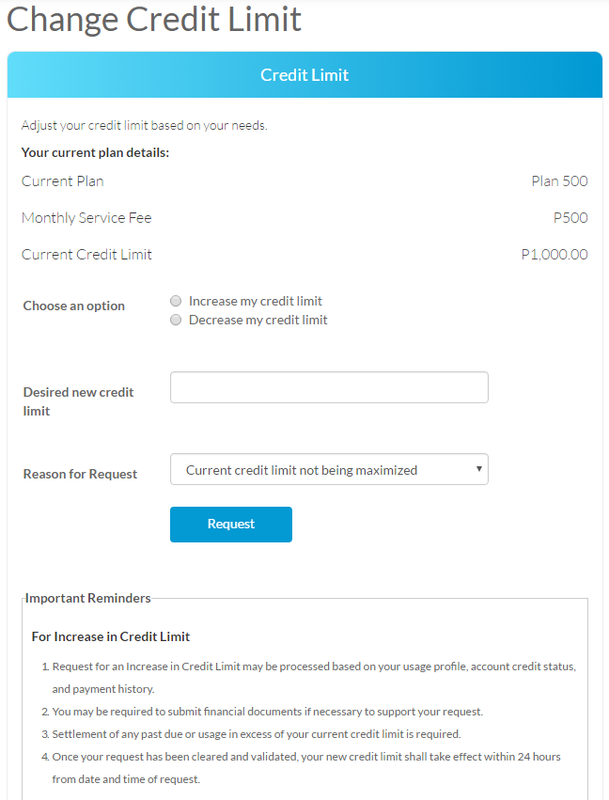 So I went ahead and submitted a request for an increase in credit limit to 3,500PhP so that it is more than the ABS. Submit the same documents I submitted when I applied to become a postpaid subscriber – just a few months back. 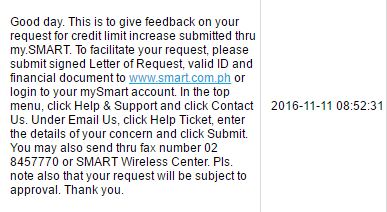 Submit those documents to http://www.smart.com.ph – when the form to request for a credit limit increase does not have any facility to do so! Go to Help & Support and narrate the concern – what the f*ck is the credit limit increase request form for? Can somebody please let them know that a quick response time means squat when it is out of context?